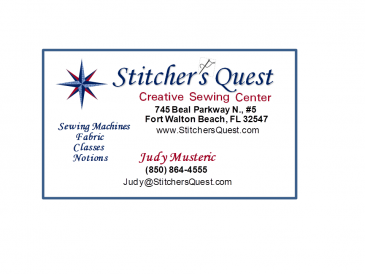 Great news this week...our website is now active at www.StitcherQuest.com. You can check out our inventory and upcoming events - we're hosting a Sip and Sew on two dates in October - class schedules are coming soon. And we've got new arrivals! Fun patterns, software, and Creative Grids! The holiday's are just around the corner! 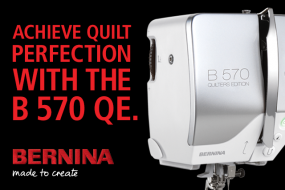 If updating the sewing room is on your Christmas list, we've got a deal for you! Have you been admiring the Fashion Sewing Cabinets in our showroom? Save 20% on orders for the the Fashion Sewing Cabinets of America line now through October 28 and they'll arrive before December 24th! 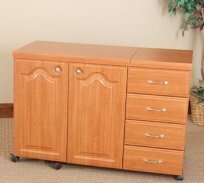 Take a look online or stop in and check out the catalog -- we offer the full line of sewing furniture and accessories from Fashion Sewing Cabinets. 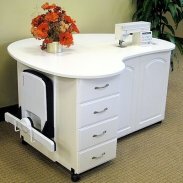 Your cabinet can be customized for your machine with a white or acrylic insert. Our October Specials are AWESOME! First, in conjunction with Breast Cancer Awareness month...for the princess in all of us, we have Sew Pink! ...and as a special gift, receive a free travel case (retail value $129) with purchase of Sew Pink by bernette during the month of October. And third, the October Accessory Special is the BERNINA Braiding Foot #21 at 25% off!